Provides a forum whereby member organizations may act collectively on a provincial basis. 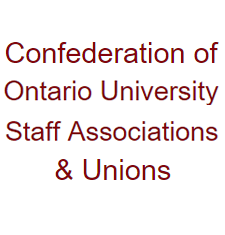 Founded in 1974, the Confederation is an umbrella group of unionized and non-unionized staff organizations at Ontario universities. The membership includes administrative, clerical, professional and technical occupational groups. COUSA embodies much of the diversity of organizational forms which characterize university employee groups. Ontario university staff are represented by both non-unionized associations and independent, provincial, national, and international unions. COUSA is an organization which bridges this organizational fragmentation. All member groups, despite differences of legal status, parent organization and approach, share the vision that Ontario university staff need a common vehicle to pool information and interact with government. COUSA does not compete with but complements other organizations: all are welcome to join. COUSA is an effective way for Ontario university staff to reach beyond their local employee-employer relationship and make an impact on the ultimate employer: government and the public.